There's also an option to pay a little something if you want to. You can also get one directly from us at shows. We only made 200 (limited edition, hand-screen-printed sleeve, hand-numbered), and they're going disturbingly fast. So scoop one up now. We're all so busy with our own stuff; we may not end up playing a ton of shows as a unit. But this one, for FE's annual parking lot sale, should be a lot of fun. GUANTE has a chip on his shoulder. When you’re a critically-acclaimed “conscious” MC, two-time National Poetry Slam champion, activist and educator best known for questioning gender constructs, talking about white privilege on MSNBC, founding the MN Activist Project and Hip Hop Against Homophobia concert series, and writing weekly op-eds about social justice, it’s easy for people to look past your actual rapping ability. And Guante is one of the sharpest, most venomous, funniest bar-for-bar rappers in indie hip hop. DEM ATLAS is the next big thing. In a Twin Cities hip hop scene absolutely saturated with talent, everyone seems to agree that Dem Atlas is something special. 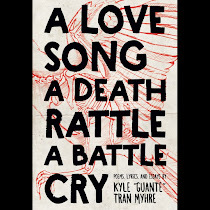 With a Pharcyde-meets-Eyedea-meets-Basquiat style, a metric ton of charisma and even more heart, he raps, sings and even scats his way across this EP, complementing Guante’s more straightforward punchlines with an off-the-wall, stream-of-consciousness flow. In little over a year, Dem Atlas has bulldozed his way into the upper echelons of one of the strongest hip hop scenes in the country, and SIFU HOTMAN is very much his party. RUBE is one-of-a-kind. Balancing his identities as a swing-sampling pioneer and boom-bap traditionalist, Rube released his first vinyl EP, “Another Gone Record,” on Munich-based record label Jazz & Milk in 2007. He also co-hosts the Boom Bap Club, a monthly podcast focusing on true-school hip hop. His production work on SIFU HOTMAN pushes his jazz/swing/hip hop fusion even further, with horn blasts, bone-snapping snares and big, slithering basslines. It’s fast, fun and full of life, music that pays tribute to hip hop’s roots while always looking forward. I am sorry that I don't donate, man. But I live in Holland, I am 17 years old, and I do not have a Visa, so, even though dying to buy the album, I cannot. But I will repay you some day. I give gratitude to these things that you do. Haha don't worry about it! We made it free for a reason. Hope you like it.